Hello, I have installed Kubernetes monitoring integration. I can see infrastructure metrics of my worker node and I can query data from Insights (e.g. SELECT * FROM K8sReplicasetSample since 1 day ago returns data), but when I click on Dashboards the Kubernetes dashboard is missing. I have the same problem. 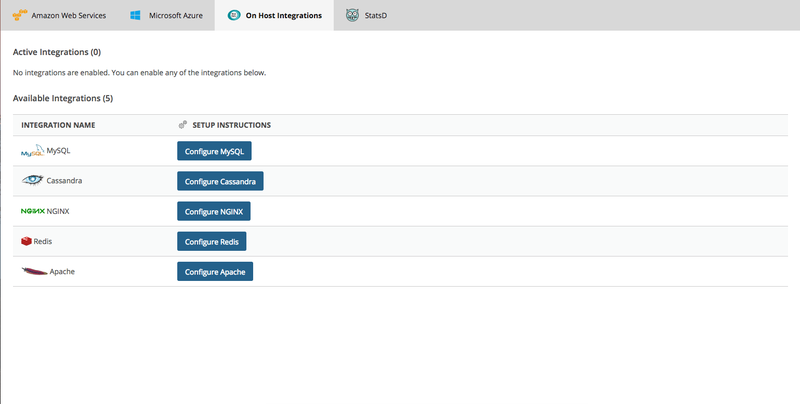 I’ve successfully deployed all the resources to my cluster, and I can see the data sent in Insight, but when I open the On Host integrations I’m seeing only 5 options and the dashboard is not one of them. I’m currently on the Infrastructure Pro trial plan and my kubernetes cluster is hosted on GKE and it’s version is 1.10.6-gke.2. My account is set to retain the data on the EU. It’s great that you’ve successfully installed and are getting data from your Kubernetes integrations. However, I think there might be something wrong with the UI, as you should have a button to access your Kubernetes dashboard. I’m going to open a support ticket on each of these posts so that we can more effectively escalate this issue to our engineering team. I will come back and post the resolution here, in this thread. It was identified as being a small issue when enabling the dashboards in the new EU region and it is now fixed. The docs said that the dashboard link will open the dashboard inside Insight but for me its opened inside the Infrastructure tab and from insight I can’t reach it. What behaviour is the one to be expected? @jacopo.giola - That’s actually a recent change you are noticing. Historically Integrations Dashboards were built into Insights. Now however new integrations dashboards are presented in the Infrastructure UI. The docs are though still accurate, in that anyone with an older integrations dashboard already set up in Insights, will still see that in Insights for the moment. When integrations dashboards are fully ported over to the Infrastructure UI, those docs will be updated. I just installed mine and the UI isn’t updating.